I’ve been asked a few times, in real life and on the blog, about matters regarding money, budgets, investing, etc. And while money can be a touchy subject I’m happy to share what works in my household. I also think it’s so important for women, especially, to talk about money matters – it’s been a subject deemed appropriate for men and taboo for women for far too long. And guess what, it’s 2011 and we’re still not being paid equally. On the flip side, though, I do believe in the wise words of Notorious BIG Mo Money Mo Problems. I’ve mentioned before that I’ve stopped measuring my success in terms of dollars. I’m not interested in keeping up with the Jones’ or running in some sort of rat race. 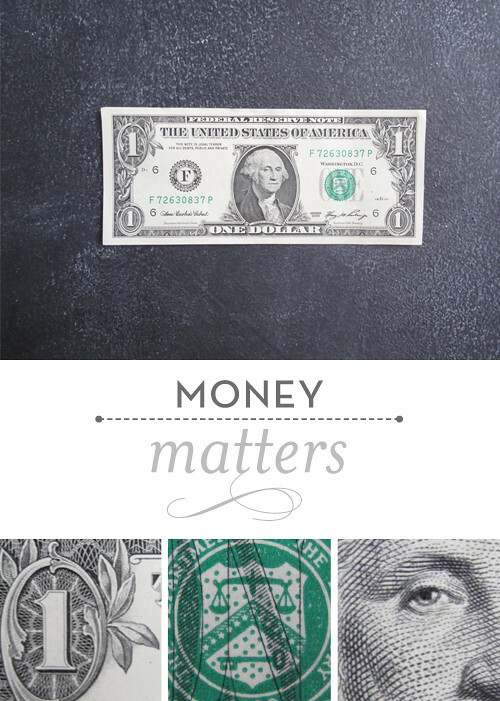 Money matters but it’s not the most important thing – not by a long shot. I live comfortably and within my means – which is what allows me the freedom to not worry about making ends meet. So, all of that said – let’s get into the nitty gritty. 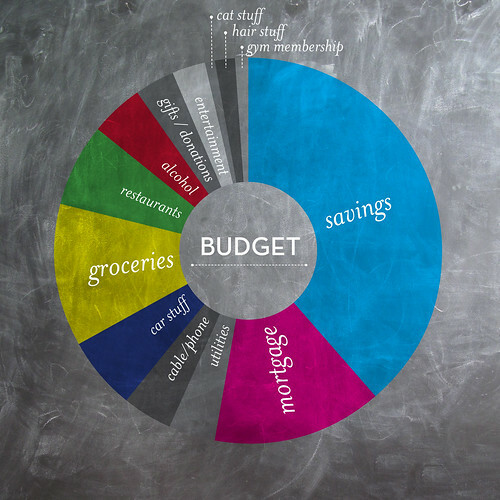 How we budget our money. A big chunk of our money goes to savings (almost half!). But we keep it all in a high-interest checking account yielding 3.5% interest. This is a great way to make your money work for you – and it affords you a nice meal each month. Once we save enough this money goes to buying investment property and/or vacation(s). When you own a home, especially right now when interest rates are so low, it’s like putting money in the bank. We put 20% down on our home to avoid paying PMI (Private Mortgage Insurance) – that saves us about $100 a month in unnecessary fees. * This budget does not include investment property mortgages – as that is usually covered by tenants. Americans have been bombarded with advertising that makes us expect our food to come cheap. Eating organic and local isn’t always cheap but it’s important to me. I cook at least 4-5 nights a week and we eat on leftovers for lunch. I should also note that I cook a meal for 6-8 of my closest friends every week – connecting and laughing over food is worth every penny. We like to eat at nice-ish places with our friends. It’s how we socialize and entertain ourselves. I was shocked (and a little embarrassed) to see so much of our budget going towards alcohol. What can I say – we drink nice beer and wine. And we always buy enough to share with friends too. One of the things I love about Jeremy is that he’s frugal (not cheap, there’s a difference) but at the same time very generous. • Get a high-interest checking account. And if you can, find a credit union to bank with. • We like to put all of our expenses on a credit card that gives us reward points (for things like new kitchen appliances). We pay it off in full at the end of each month so that we don’t have to pay any interest. Meanwhile, our money is sitting in the bank gathering interest in our high-yield checking account. • Invest in a 401k. If you work at a company that matches invest up to the maximum amount they will match. • Invest in real estate – especially if you live in an area where real estate is dirt cheap. Like Oklahoma. Being a landlord can be challenging at times but it’s not as hard as you might think. Kelly at Tearing Up Houses is an incredible inspiration and resource when it comes to real estate matters (and she manages to be hilarious at the same time). • Don’t buy new cars. The truth is – I really want a new car right now. But when I consider the payments, insurance and the environmental impact it takes to produce and drive a new car it’s just not worth it. So I’d like to hear from you all. What sorts of things do you do to leverage your dollars? Any money tips? I’m going to continue to expand on this new “matters” series. I’m an open book, so let me know if there are any other life/beauty/money/marriage/food/etc. topics or specifics you’d like me to dive into. Help me figure out what to talk about next!